In our work with families across Florida, we are often asked about the best way to convince a parent to move to senior living. Adult children worry about senior loved ones for a variety of reasons ranging from loneliness to safety. Unfortunately, there is no easy way to talk an older adult into making a move they are reluctant—or even unwilling—to make. The key is to begin an open and honest discussion and to try to discover what might be keeping your senior loved one from moving. 1. Educate yourself: Begin by educating yourself about senior living before you tackle the topic with your loved one. Read everything you can about the different types of senior living. Visit local communities’ websites to see what they offer, and narrow down your search to a few that look like a good fit. Then visit each one in person without your family member. Create a list of questions ahead of time and thoughtfully work your way through them during your tour. When you feel like you have a good understanding of what senior living is (and isn’t), you will be more confident discussing moving with your loved one. 2. Plant the seed: Instead of springing the idea on your family member without any warning, start by planting a small seed. Is a new assisted living community under construction nearby? Go out of your way to drive past it when the two of you are together so you have an excuse for bringing it up. Or ask how one of their friends is doing who has already made the move. Think about how you can bring the subject up. Talk about it, but let the discussion percolate without going into any greater detail. 3. How they feel: The next time you are helping your loved one complete a household task or repair, ask how they feel about things. Are they fearful living alone? Have long-time neighbors moved away? Is the house getting to be too much to manage? If you can get them to share how they are feeling, it might open the door to gently offering solutions. This might also be a good way to discuss how you miss being able to spend time with them that isn’t centered on chores and errands. If they move to a senior living community, the two of you will have free time to spend together doing more enjoyable activities. 4. Realistic expectations: First, it’s important that you head into any discussion about moving with realistic expectations. All too often families think because they believe a senior living community might be the best choice, the only goal left is to convince a parent. They also think things can be resolved in one discussion. The reality is this will likely be a series of discussions. 5. 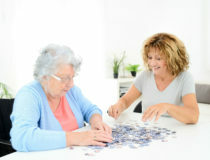 Trial stay: Another avenue that might help is to ask your loved one to consider a short-term stay at a senior living community, commonly referred to as respite care. 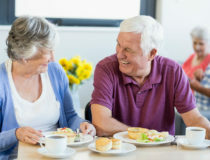 This is a non-threatening way to give them an inside look at all of the benefits senior living has to offer: full calendar of life enrichment programs, dining services, housekeeping, wellness activities, and more. If you have questions about senior living or what type of care might be the best option for a loved one, we are happy to help. Call the Sonata community nearest to you to learn more!